Robert N. Poindexter, 92, of Atwood, IL, passed away at 7:30 pm, Saturday, April 9, 2011 at the Arthur Home, Arthur, IL Funeral Services will be held at 11 am, Wednesday, April 13, 2011 at the Hilligoss Shrader Funeral Home, 66 East US Highway 36, Atwood, IL, with Pastor Jason Braaten officiating. Visitation will be held 1 hour prior to the services at the funeral home. Burial will be in the Mackville Cemetery, Atwood, IL with military graveside rites accorded. Bob was born on December 19, 1918 in Oblong, IL, the son of Grover and Ethel Lindsay Poindexter. He married Mabel M. Runge on October 14, 1945 in St. Peter, IL. She preceded him in death on December 29, 2003. Survivors include his son: Terry Poindexter of Tuscola, daughters: Mary Stephenson of Decatur and Nancy Hogan of Ft. Collins, CO, five grandchildren, seven great-grandchildren, one sister: Shirley Green of Champaign. He was preceded in death by his parents, four brothers and four sisters. Memorials are suggested to the Alzheimers Association or the Arthur Home. Bob retired in 1982 from USI Chemical Company, Tuscola, IL, where he worked for 30 years as a shift supervisor. He was a member of the Immanuel Lutheran Church, Tuscola, IL and a member of the James Reeder American Legion Post #770, Atwood, IL. Bob was a US Army Veteran of World War II. Bob was a faithful volunteer at the Arthur Home and he enjoyed delivering peace meals. He was an avid flower gardener and enjoyed doing yard work. He enjoyed and loved his family very much and he will be sadly missed. 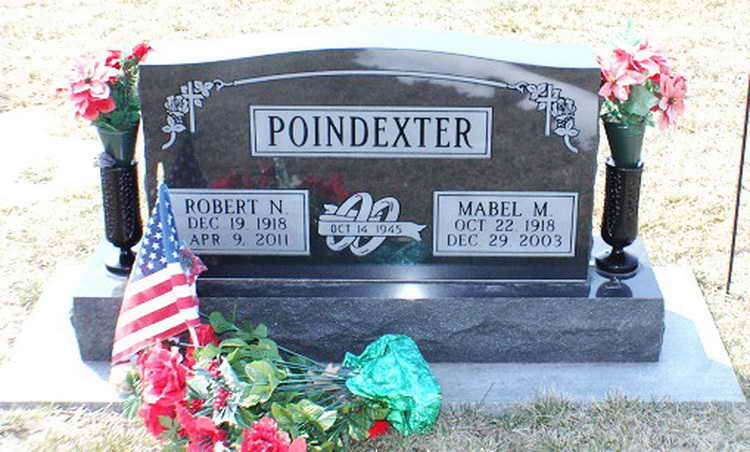 Grave markers for Robert N. Poindexter in the Mackville Cemetery, Atwood (Piatt county), Illinois. Robert enlisted in the Army at Camp Grant, IL on 23 January 1942. 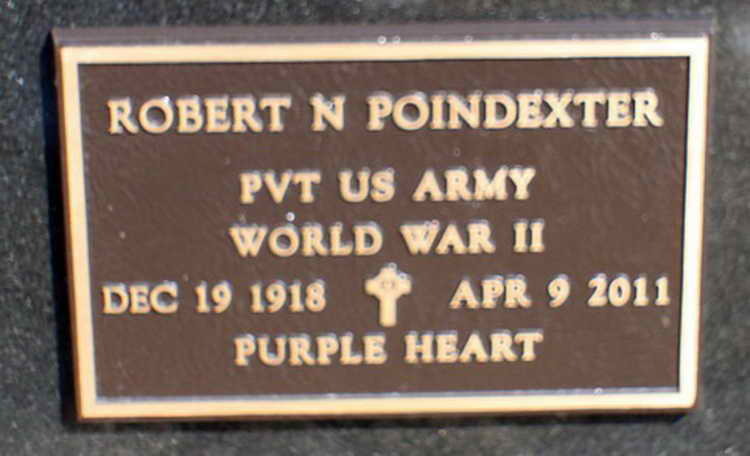 Cpl Poindexter transferred from the 509th PIR to Company C, 508th on 16 February 1945. He was reduced to the grade of Private two months later. His military decorations include the Purple Heart and the Bronze service Arrowhead Device awarded for the Southern France Campaign and Airborne Operations.